Sash lifts from Caldwell provide the end user a means to operate the sliding functionality of the sash window. Providing ‘easy grip’ for maximum ease of use and available in a range of styles, our sash lifts are suitable for any sash window installation. 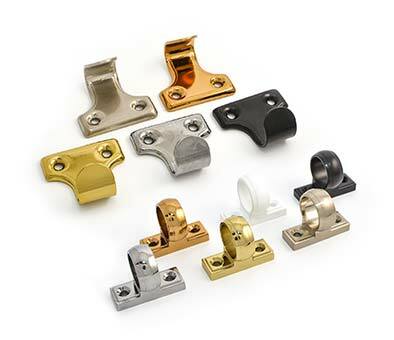 Caldwell can also supply sash rings for when a pole is needed to operate out-of-reach sashes, meaning that we can provide appropriate decorative hardware for all sashes, regardless of required functionality. 7761 Sash Lift: Like the 8790 model, 7761 sash lifts simultaneously offer slim, neat aesthetics, whilst also providing uninhibited operation of the sliding sash mechanism. 7761 sash lift holes are 4.25mm in diameter. UK624 & UK745 Sash Rings: For use with sash poles, UK624 & UK745 sash rings are ideal for installing on sashes which would otherwise be inaccessible. Both models are authentically styled, and are also pressure die cast for sash rings which are more consistent than brass alternatives. Both models feature 4.75mm holes, with the only difference between the two being the offset. UK616 Sash Hook: For fabricators and specifiers looking to achieve a more traditional aesthetic, Caldwell can supply UK616 Sash Hooks which are not only authentically styled, but are also strong because of their pressed steel formation. Compared with brass, the UK616 steel sash hook is more consistent in finish and performance, and features 5.0mm diameter holes.